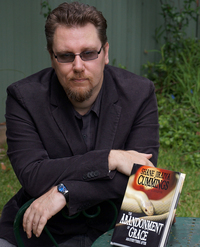 Shane is an Active Member of the Horror Writers Association and former Vice President of the Australian Horror Writers Associa Shane Jiraiya Cummings has been acknowledged as "one of Australia’s leading voices in dark fantasy". Shane is the author of the forthcoming Yokai Wars series (Circle of Tears, Clockwork Legion, and Blight of the Underworld) and the dark fiction books The Abandonment of Grace and Everything After, Shards, the Apocrypha Sequence (Deviance, Divinity, Insanity, and Inferno), and the Ravenous Gods cycle (Requiem for the Burning God and Dreams of Destruction). He has won the Australian Shadows Award and two Ditmar Awards, and he has been nominated for more than twenty other major awards, including Spain's Premios Ignotus. To ask Shane Jiraiya Cummings questions, please sign up. Insidious is a word I’ve always liked. In one simple word, it represents phenomena I see in life all the time: the creep of entropy or the shifting of the Overton window. Trends come and go, but genuine, radical changes to a society are usually insidious. We’d love your help. Let us know what’s wrong with this preview of Dead of Night by Andrew McKiernan. "There were so many great stories in this collection! Lots of these authors were new to me and I'm now sitting here making a list of those I need to explore further. Definitely a sign of a great collection!" We’d love your help. Let us know what’s wrong with this preview of Rage Against the Night by Shane Jiraiya Cummings. "Very cool action Cthulhu Mythos and the lead character is well portrayed begging that he appears in more stories." Thanks for the add, Shane.